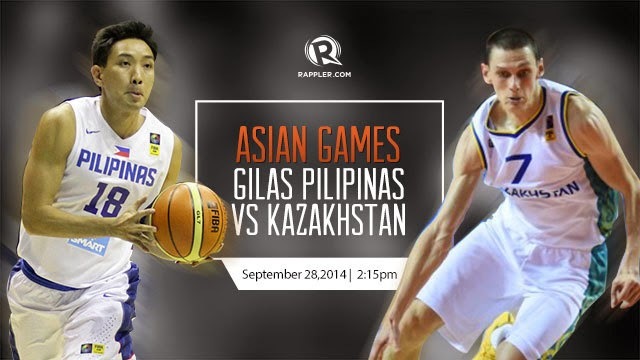 Watch the full replay video of Gilas Pilipinas vs Gilas Pilipinas vs Kazakhstan - September 28, 2014. Gilas Pilipinas SACRIFICE was done today, we fight but we loss no one to be blame on this. Gilas team we salute you guys for fighting to our country in name of basketball. Gilas defeats Kazakhstan but drops out of contention. Gilas Pilipinas will not advance to the Asian Games semis after failing to win by at least 11 points for a superior quotient. Gilas Pilipinas shut the door on Kazakhstan, 67-65, but will not advance to the semis after failing to win by at least 11 points in Group H quarterfinals action of the 2014 Asian Games in Incheon, South Korea on Sunday, September 28. This post is under Gilas Pilipinas vs Kazakhstan REPLAY VIDEO.